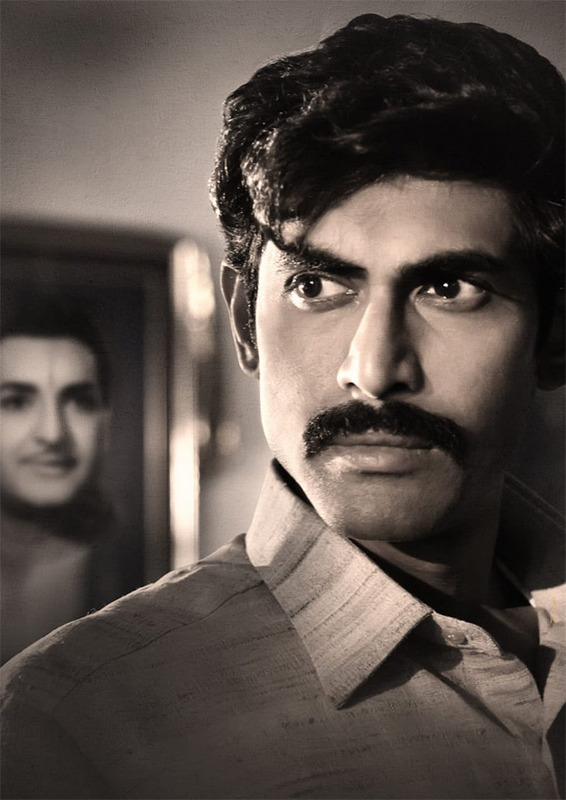 HomeCinemaMasalaFirst Look: Rana Daggubati as young Chandra Babu Naidu in NTR biopic demands your attention Right Now! Ever since the announcement of NTR Biopic was made, the film is already a creating a lot of buzz amongst the fans. Well, it should not come as a surprise as the film is one ambitious bilingual film. Not only that, the film stars South star Nandamuri Balakrishna, Vidya Balan, Rana Daggubati in the pivotal roles. As earlier it was revealed, Baahubali actor is going to essay the role of current Chief Minister of Andhra Pradesh, Chandrababu Naidu. Now, we have the first look of the actor and he looks absolutely suave. In the first look that has been unveiled this afternoon, Rana Daggubati is seen as younger Chandra Babu Naidu. He is sporting a moustache in this black and white photo. One can even see NTR’s photograph in the backdrop. Nevertheless, we must say that Rana Daggubati looks suave in the first look as NTR’s son-in-law in the picture. As earlier mentioned Rana Daggubati Rana did immense prep for the role and even met Nara Chandrababu Naidu along with his director Krish and Nandamuri Balakrishna. It was also earlier reported that the actor shot the NTR Biopic at Nandamuri Taraka Rama Rao’s residence in Abids. Coming back to the film, Vidya Balan will essay the role of Telugu superstar and former CM of Andhra Pradesh NT Rama Rao’s wife Basavatarakam. Rakul Preet Singh will be essaying the role of the late Sridevi in the NTR Biopic. Also, NTR’s son Nandamuri Balakrishna will be seen as the protagonist. Hey Beyonce, This Is Why Women Need To Stick Together!